Organic, inorganic, natural, artificial. These and similar terms like chemical, mineral, synthetic, and sustainable can be confusing due to the use of many undefined words or words with dubious meanings. Chemically speaking, organic compounds include the carbon atom in their chemical composition regardless of their source. Inorganic chemicals, then, are those without carbon. For example, propane gas is an organic compound because its molecule is composed of three atoms of carbon and eight atoms of hydrogen. Are "organic fertilizers" those that contain carbon? Not necessarily. Things have become more complicated than that. Years ago, the term organic meant that something was pesticide-free, but government regulation has created a whole new bureaucratic vocabulary. For example, limestone, mined rock phosphate, and Chilean saltpeter are inorganic chemicals whose use government regulation permits in organic agriculture. For the purpose of this fact sheet, we will use the term sustainable fertilizer to describe those derived from animal and plant byproducts such as manures, blood, bones, compost, cottonseed meal, etc., produced in manufacturing and farming (Table 1). All these materials are chemically organic regardless of being approved by federal government's Organic Materials Review Institute (OMRI at www.omri.org). Fertilizers derived from animal and plant byproducts are only minimally processed and their nutrients remain in their natural forms as opposed to being industrially separated and purified. It has been shown that individuals interested in buying products that have been grown in a sustainable way comprise a substantial portion of the ornamental market. Furthermore, these customers are even willing to pay slightly more for these products. Greenhouse growers do not have to be "organic growers" to use sustainable fertilizers. Growers can simply replace the water-soluble mineral fertilizers (e.g., 20-10-20) of a portion of their crops with sustainable fertilizers and still continue with their traditional cultural practices. It is important, however, to let consumers know which plants were grown with what fertilizer in order for them to choose. It is also good marketing to let consumers know when crops involve sustainable practices and materials. Sustainable fertilizers tend to have smaller nutrient ratios. Examples of sustainable fertilizers are Sustane 8-4-4, Scotts Miracle-Gro Organic Choice All-Purpose 7-1-2, and Daniels 10-4-3. A list of commercially available sustainable fertilizers can be seen in Table 2. On the other hand, ratios of mineral fertilizers tend to be larger, such as the case of one of the most used fertilizers in greenhouse containerized floriculture: Peters 20-10-20 water-soluble fertilizer. How do sustainable fertilizers work? Sustainable fertilizers sold under a brand are, most likely, the result of a high-quality compost process. When applied to substrates, these products are degraded by micro-organisms making the nutrients available to plants. As a consequence, these fertilizers can be classified as slow-release fertilizers because they supply nutrients in small quantities over a longer period of time. Companies producing and selling sustainable fertilizers should provide information about their longevity (the time it takes for all nutrients, at a given temperature, to be totally released). Unfortunately, longevity of sustainable fertilizers is not always provided. Anecdotal information indicates that longevity of sustainable fertilizers is shorter than for controlled-release fertilizers. Factors such as temperature and water availability influence microbial activity that, in turn will influence nutrient availability. In fact, temperature and water availability are crucial: soils that are too dry or too wet, or too cold or too hot, will reduce microbial activity and hence nutrient availability. Some of the products used to produce sustainable fertilizers may increase the substrate salt levels above acceptable levels making electrical conductivity (EC) monitoring very important. Numerous brands of sustainable fertilizers can be found on the market. Each fertilizer responds differently than the water-soluble fertilizers used in the greenhouse industry. As a consequence, there are no clear standards for managing nutrition when using sustainable fertilizers on soilless growing mixes. Table 1. Non-branded materials that can be used as sustainable fertilizers and their estimated analysis (N-P-K). Nutrient levels are approximate because they can change from batch to batch and from year to year. Table 2. Some examples of commercially available sustainable fertilizers, their analyses, and material sources used in their production. Some of them may be sold only at retail stores for the home gardener. Most sustainable fertilizers are dry and are applied as powders or small granules to the growing mixes either before or after planting. Other fertilizers are applied as liquids (e.g., Daniels) or liquid emulsions (fish emulsion). Liquid fertilizers can be applied using injectors, making multiple applications during the life of the crop possible. There is the potential for variability between batches of the products used to make sustainable fertilizers (Table 1) because many of them are derived primarily from waste materials. Only companies selling consistent products will be successful, because greenhouse growers expect consistent sustainable fertilizers. Bio-reactions can occur during the storage of these materials. Sustainable fertilizers with high carbon-to-nitrogen ratios and adequate microbiology in the presence of moisture could begin to decompose. Should decomposition occur, the macronutrient content as well as other key attributes of the organic fertilizer could become altered. Sustainable fertilizers should be stored in a dry environment and in containers that protect the fertilizers from the vermin that can feed on these materials. It is a good idea, for growers who have limited experience with sustainable fertilizers, to start small. Selecting a crop or a portion of a crop and becoming familiar with the new cultural practice would be prudent. After that, slowly expand to more crops/areas. Always read the label of the product and consult your fertilizer sales representative or your Extension educator if you have any doubts. At The Ohio State University, we have grown numerous bedding and container floriculture crops and some herbs with a single (initial) application of sustainable fertilizers (Figures 1–4). We were able to show that these fertilizers can be used to produce quality crops. In some cases, with sustainable fertilizers, the plants were slightly smaller but still marketable. Under certain circumstances, smaller plants may be desirable to avoid the application of plant growth regulators. Figure 1. Petunia plants grown with Miracle-Gro Organic Choice All-Purpose 7-1-2 at a rate of 5.9 grams per pot (left), Sustane 8-2-4 at a rate of 5.1 grams per pot (center) and Osmocote 15-9-12 at a rate of 2.7 grams per pot (right). Top = side view; bottom = top view. Figure 2. 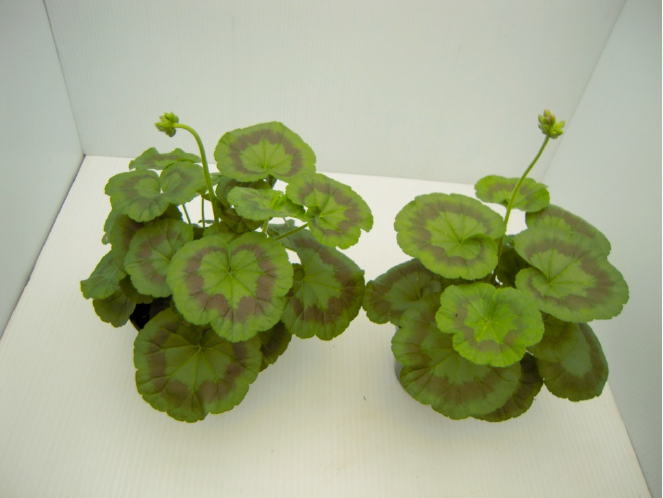 Seed geranium plants grown with a water-soluble fertilizer Peters 20-10-20 at a rate of 100 ppm N applied with irrigation as needed (left) or with a single application of Sustane 8-4-4 of 2.6 grams per 4.5-inch container (right). Figure 3. Basil plants grown with a water-soluble fertilizer solution of a Peters 20-10-20 at a rate of 100 ppm N applied with irrigation as needed (left) and three rates of Miracle-Gro Organic Choice (from left to right): 5.9, 4.5, or 3 grams per 4.5-inch container. Figure 4. New Guinea impatient plants grown with (from left to right): water-soluble fertilizer Peters 20-10-20 at a rate of 100 ppm N applied with irrigation as needed; Osmocote 15-9-12 at a rate of 3.2 grams per pot; and three rates of Miracle-Gro Organic Choice (from left to right): 2.2, 3.0, or 5.9 grams per 4.5-inch container. Disclaimer: This publication may contain fertilizer recommendations that are subject to change at any time. These recommendations are provided only as a guide. It is always the applicator's responsibility to read and follow all current label directions for the specific fertilizer being used. No endorsement is intended for products mentioned, nor is criticism meant for products not mentioned. The author and Ohio State University Extension assume no liability resulting from the use of these recommendations.